Plot: Giant Robots, sociopaths, madmen waving guns: these aren’t just the problems the Mobile Police have to deal with every day, these ARE the Mobile Police! 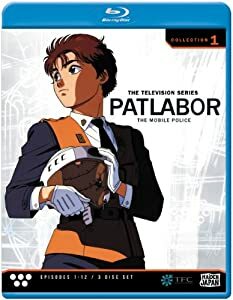 But in a world where giant robots called Labors are frequently used for criminal purposes, the boys and girls in blue have to face things that are even bigger and scarier! So when police cadet Noa Izumi comes in to take a pilot aptitude test and instead initiates a high speed chase after a stolen Police Labor, it’s clear that she’s got exactly the right combination of guts, brains and just plain crazy that the Second Special Vehicles Division desperately needs. But fitting into the frequently insane lifestyle of SV2 won’t be easy. She’ll have rivals for the pilot seat of the mech that’s stolen Noa’s heart, and her patrol duties will include herding whales, exorcising hauntings and fighting rogue military units on top of the usual terrorists. On the other hand, she gets to carry the biggest handgun EVER. 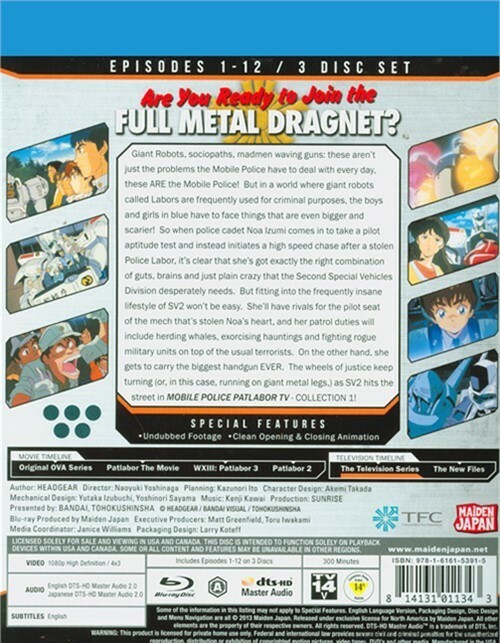 The wheels of justice keep turning (or, in this case, running on giant metal legs,) as SV2 hits the street in Patlabor TV: Collection 1!